Every Iowa household will be receiving a postcard in the mail later this month from the Iowa Department of Public Health . I-D-P-H spokesperson Polly Carver-Kimm says the postcard contains information about influenza and the H-1-N-1 flu virus. "We wanted to really concentrate on the personal actions that folks can take to prevent the flu and what they can do to fight all kinds of viruses," Carver-Kimm said. 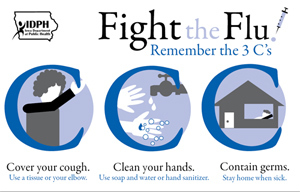 "So, our message is remember the three ‘C’s’ – cover your cough, clean your hands and contain germs by staying home when sick." Right now, the H-1-N-1 flu is not as widespread or severe as the regular, seasonal flu. But, health experts say the new virus could spread and become more dangerous. "On the back of the postcard, there’s also a message from (state epidemiologist) Dr. Quinlisk advising folks to get the seasonal flu vaccine and also talk to their health care provider about the H1N1 vaccine when that becomes available," Carver-Kimm said. State health officials are printing and mailing over 1.5 million postcards. The mailing carries a price tag of nearly $200,000, which is being paid for by an H-1-N-1 grant from the federal government. Iowa may be the only state in the nation conducting a postcard campaign. "I don’t know if any other states are doing a postcard mailing," Carver-Kimm said. "I know about every state is preparing some sort of media campaign, but I have not heard of any doing a postcard." Iowans can expect to receive the postcards sometime around the end of September.